"Lost Episodes" is an irregular series highlighting shows from the Mickey Mouse Club's first two seasons that for one reason or another are not readily available for viewing today. The shows are not truly lost, as the 35mm film masters are presumably archived by Disney. However, photos and information about the shows are so rare as to render them "lost" to general knowledge. This page contains storylines and production details for rare second season Fun with Music Day and Talent Roundup Day shows. They are not available on YouTube, Disney official DVD releases, nor are they circulated among private collectors. Most of the content here comes courtesy of Randall Nakashima. Due to the rarity of these shows, few photos are available to illustrate them. Song recordings where present are from Mickey Mouse Club records, not from the original episodes. With: Ensemble and special guest "Arloha"
Note from Webmaster and Writer: We have reviewed the available photographs of the dancing girl “Arloha” in this Fun with Music Number. We have also reviewed the original script regarding the length of time Arloha stayed on camera. Finally, a third viewing of the original number was taken. We have concluded that the character of Arloha was not played by Mouseketeer Sherry as we originally believed. We queried two of the Mouseketeers who were part of the production and they confirmed that Arloha was not Sherry. Unfortunately, neither of the Mouseketeers could recall the identity of the girl who played Arloha, or how she was selected for the number. We suspect she did not interface much with the Mouseketeers on the set. The original review had been revised, accordingly. Synopsis: The entire Mouseketeer Music Class takes a Hawaiian vacation where they meet a Hawaiian dancing girl named Arloha (Sherry). Half the cast play tourists and the other half their native hosts, but it’s almost impossible to tell who’s who on a black & white television. 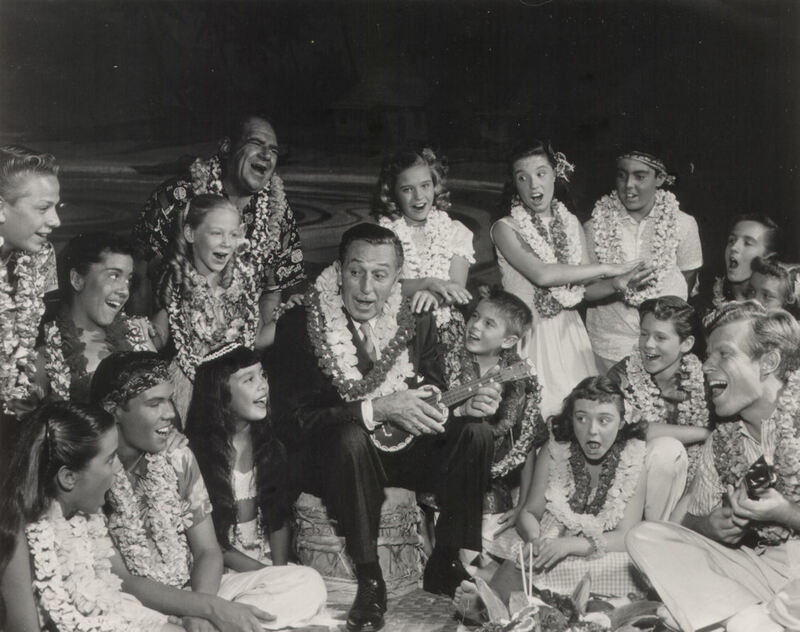 Storyline: The scene opens in the Mouseketeer Music Classroom with Jimmie (wearing glasses) standing in front of the class wearing a lei and holding a ukulele. Jimmie: "All right boys and girls, when you see this ukulele, what place to you think of?" Jimmie: "That’s right boys and girls, only in Hawaii they pronounce it: Ha-vi-ee!" Jimmie: "Great!! Here it is! Now a ukulele is tuned: G-C-E-A!" (plunks strings) "And it’s real easy to play! Now, who knows what a hula is?" Darlene: "I do Jimmie. A hula is a kind of dance." Dennis: "I thought it was a song." Jimmie: "You’re both right!" (starts strumming) "It’s the same thing! In Hawaii, they dance a song!" Everyone is seated as noted as Karen and Cubby enter from the right. Cubby beats a small drum set on the wicker counter and announces: "Arloha!" The music slows and Arloha bows to signify the ending (pau). Arloha does a final bow with her head and hand to signify the ending (pau). Same scene, but the sky is now darkened and the Mouseketeers are sitting down at a luau in full swing. The opening shot is a roast pig on a huge platter, which Roy carries in and places in front of Cheryl, Lonnie and Tommy at the right. Karen brings a platter to Cubby for Arloha, Cubby begins passing the plate to the right. Jimmie: "Kids, did you ever have such fun in your whole life??!!" Charley: "These Hawaiian ribs are wonderful!" Doreen (assertively): "I’m going to come to Hawaii every year for a holiday!" Cubby, standing behind the wicker counter begins playing a drum vamp as the music rises and the song, Holiday in Hawaii begins. Arloha rises and begins to do a rhythmic dance with the bamboo rattle sticks (pu’ili). Karen follows her, dancing, followed by Darlene. Beat on a coconut drum! Every Day is a holiday in Hawaii! Try hard to be caught by you! And just raise cane all day!!! Pig as big as a cow!!!! EVEN THOUGH WE HAVE TO SAY ALOHAAAAA…. Initially, thanks to Lonnie Burr for making his personal copy of the script available for public viewing. It made my life a lot easier. With only 17 Mouseketeers in Season 2, seven less than the previous year, ensemble numbers like this were more organized and gave each Mouse a chance to participate. Annette must have been away doing some serial or other. As noted, Hip movement is of prime importance in doing the hula, and to put it politely, Margene and Doreen looked better doing the hula than the other Mousekegirls. After viewing it a third time, I would have to add Sharon to this short list. Her body control was uncanny. Although it was filmed in the studio, some of the Aloha spirit seems to have rubbed off on this number as it was noticeably more fun and relaxed than the other Music Around the World FWM numbers. Again, the premise was that half of the Mice were the native hosts, and the other half tourists. The six Mice that coached Arloha in her dance were all natives, but it was difficult to make a distinction in Black & White. The makeup shows more of a difference in the color photo with Walt. I can’t imagine why this number has never been made available to the public, unless people could be disappointed that Walt doesn’t appear? 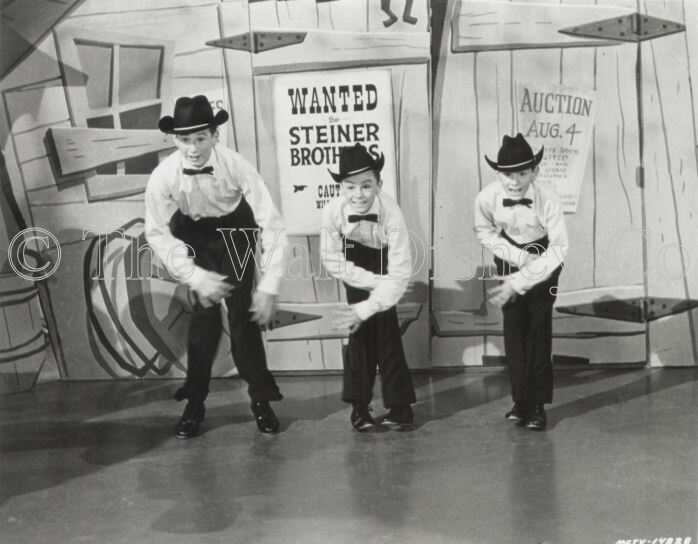 In addition to Bobby’s war dance, the song, Holiday in Hawaii, was used in the Ribuca Twin’s Talent Roundup show in Season 3. I’m glad Charley liked the ribs. I sometimes wonder what happened to the pig Don Underhill was holding. With: Eileen, Cubby, Annette, Lonnie, Sharon, Dennis, Cheryl, Jay-Jay, Jimmie, and Roy. Synopsis: The Steiner Brothers perform segments of their nightclub act for the Mouseketeers. “Mouseke-Grad” Ron Steiner returns with his brothers for the first Talent Roundup of the Second Season, although little mention is made of Ron’s Mouseketeer status, and there is no verbal interaction between Ron and any of the Mice. None of the Mice introduce the brothers as discovered talents. The camera opens on a poster on the wall of the Blacksmith Shop. Annette, Eileen and Sharon enter from right. Lonnie, Cubby and Dennis enter from left. Eileen reads: "WANTED! THE STEINER BROTHERS. Caution: will dance to any music!" Annette follows: "The Steiner Brothers capture every town where they’re dancing!" Jimmie adds: "And they’re real musical desperados!" Jay-Jay runs in from the right: "Look out everyone! Here come the Steiner Brothers!" The three Steiner Brothers saunter in from the right, like gunfighters. They are dressed in black slacks, white tuxedo shirts, and black cowboy hats. They have both hands on the buckles of their gun belts. Roy Steiner (the oldest and tallest) does a quick tap step and shakes hands with Lonnie: "I’m Roy." Ron Steiner (in the middle, age-wise and standing between his two brothers): "I’m Ronnie." He does a flap step leaning back and steps forward to shake hands with Dennis. Rob Steiner (the youngest and shortest): "I’m Robert!" Does a hop-over to shake hands with Cubby. As a trio, the brothers continue to saunter towards the closed door of the Blacksmith Shop, hands on buckles, then turn in unison towards the camera. Jimmie: "Dry Gulch is all yours, Steiner Brothers! Take Over!" The brothers unbuckle their gun belts and hand them to the boy-Mice. The three eye each other, then the band breaks into fast paced tap music. The brothers begin a quick-paced, Gene Kelly-esque, tap number, going from a flap step, turn to a shuffle step with ball changes, clapping as they shuffle and step back. They do a set of trenches (knees bent), then a Charleston, then sugar foot to a shorty-George (twice), do time-steps to a buffalo, turn and trot off through the door of the Blacksmith Shop. 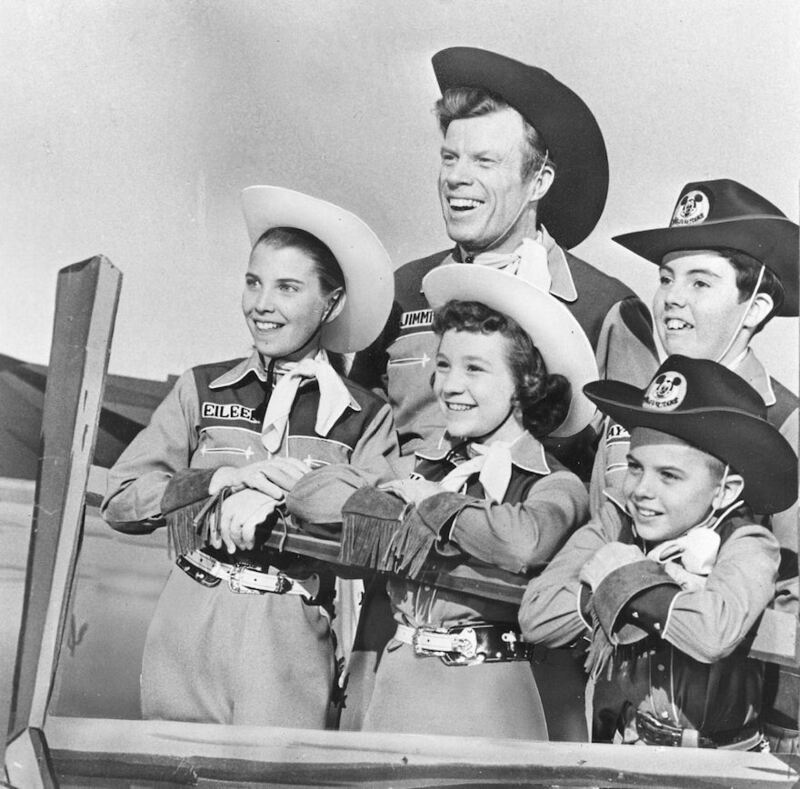 They leave the Mousketeers applauding and cheering as in that often-seen reaction shot of Eileen, Jimmie, Sharon, Jay-Jay, and Cubby by a slatted fence (which was shot separately, incidentally). The brothers reappear through the doors of the Blacksmith Shop, this time wearing white dinner jackets, straw hats and holding bamboo canes. They begin a slow soft shoe tap to Strollin’ by the Beach (later used in the Season 3 FWM Day, A Day at the Beach). The boys start with a front, then a back Essence (shuffle step to a backstep, ball change to a flap step), go to time steps, then flap steps, then a march turn, going to shuffle steps, then time steps again to a jump turn, to a crossing shuffle and lifting their hats at the finish. The Mousketeers, now joined by Cheryl, are gathered in front of the Blacksmith Shop with Jimmie in the middle. Jimmie: "Well, the Steiner Brothers have captured Dry Gulch!" Sharon: "Yeah, they sure have taken over the town!" Roy (entering from left): "Look out! Here they come now!" The brothers return through the door, this time wearing black dinner jackets and carrying a trombone, sax and trumpet as props. More generic tap music plays as Roy goes into a fast shuffle step, followed by his brothers. The boys do a series of trenches (back scraping step) in four directions, go back to timing steps, then another set of three trenches, Roy goes into a modified wing with a toe stand, followed by Ron doing a wing with arms rotating, followed by Rob doing his signature jumps in the air, then back to flap steps. The brothers finish to the applause and cheering of the Mouseketeers who gather around them. Jimmie steps behind Ronnie and puts his hand on his shoulder. Ron says as he looks to both sides: "Thanks, Mouseketeers! It sure is good to see all my old friends again!" Jimmie: "Well, it’s nice to see you too, Ronnie! Boy, and since being a Mouseketeer, you’ve gone on to do big things with your two brothers! But remember, you’ll always be a Mouseke-Graduate! And now, Ronnie, time to say..."
(Jimmie places the Mortarboard with ears on the head of Ron who has the sense to fasten the strap under his chin prior to the last dance). Good luck and fare thee well! We think that you are swell! The band plays a fast version of Jimmie’s Mouseke-grad song. The boys go into a series of Gene Kelly-esque toes and heels, then to side balance steps, then Roy does a series of essences, dropping down to one arm with legs out, then switching. Ron (wearing the Mouseke mortarboard) does a series of three mid-air splits, then Rob quickly drops to the floor on one hand, and does a “coffee grinder” (similar to break dancing) as the brothers finish to the cheers of the Mouseketeers. Thanks again to my dance consultant Joanne Gervais Ainsworth who described the steps to me. I have no idea what I wrote. The brothers’ four-part appearance was about eight minutes long, probably exceeding Ron’s total screen time as a Mouseketeer. Of course, Ron’s performance still begs the question why the producers hired a dancer of his caliber and never featured him in a dance. This was easily the most polished and professional Talent Roundup performance I’ve seen, on a level well above the baton twirlers and accordion players. Is it my imagination, or were Lonnie and Sharon looking admiringly at their former colleague? Is it also my imagination, or was Cheryl looking at Ron with some interest? Not out of the question since Ron was the best-looking of the brothers. Make sure you spell my name right on the check, Ron. The Mouseke-grad song was only used twice: for Ron and Mary Sartori. I personally think that Jimmie would like to have had more of his old Mouseketeers back, but the show just ran out of episodes. Jimmie’s comments to Ron were not an exaggeration. The Steiner Brothers were regulars on the night club circuit, played Las Vegas and Reno, and appeared on the Ed Sullivan Show. Of course, the Brothers were from Winnipeg. Ron says, and Darlene confirms, that neither knew the other was Canadian until years later when Darlene played an engagement with them. I found it very curious that there was no mention that Ron was a Mouseketeer until nearly the end of the set. I don’t think Ron had enough screen time for any of the viewers to recognize him as a Mouseketeer. And not wearing mouse-ears didn’t help. Also curious was the Brothers walking-in and introducing themselves to the Mouseketeers. Roy and Rob participated in the Mickey Mouse Club Circus the previous Christmas and had a free pass to Disneyland every time Ron performed. Per Ron, they enjoyed that. Perhaps not too curious is the fact that Ron appeared on the first Talent Roundup of the Second Season. I think that the producers were sending an indirect message to the viewers acknowledging that many of Mouseketeers weren’t back, but don’t worry, they’re doing fine—like Ronnie. Not necessarily true, of course. Finally, thanks too, to Ron, for being a great source of information as well as a friend.